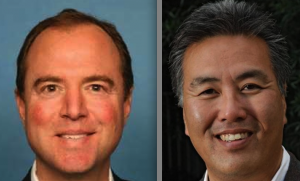 WASHINGTON – Reps. Adam Schiff (D-Pasadena) and Mark Takano (D-Riverside) both spoke on the House floor Wednesday to honor the legacy of George Aratani, the Nisei philanthropist, business owner and community leader who passed away last week. “I rise today to honor a constituent and philanthropist, George Aratani, who passed away last week. “Mr. Aratani was a part of the Greatest Generation, and served his country as a member of the Military Intelligence Service, or MIS, during World War II. “His service came at a time when tens of thousands of his fellow Japanese Americans were interned in camps scattered in the Western United States. “He chose to serve and defend America with no guarantee that his own freedom would be defended in return. “I was proud to work to ensure that MIS members like George Aratani, and all of the ‘Go For Broke’ veterans, received the credit and thanks they were due through the Congressional Gold Medal. “When he returned home, Aratani started and ran several businesses, and dedicated himself to Japanese American educational and cultural causes, including the Go For Broke Veterans Memorial and Foundation. “I rise today to honor the legacy of George Tatsuo Aratani, a philanthropist and business executive who was a champion for Japanese Americans. Mr. Aratani was born and raised in California, and along with 122,000 other Japanese Americans was forced into internment camps during World War II. “Never letting the poor situation get the best of him, Mr. Aratani used his bilingual skills to serve his country in the Army Military Intelligence Service. “Following the war, he started two successful businesses — Mikasa Tableware and Kenwood Electronics — and enjoyed a wonderful life with his family. “Though he achieved great commercial success, he will always be remembered for his upstanding citizenship in his community. Mr. Aratani and his wife, Sakaye, established the first endowed chair to study the injustice of the Japanese American internment and the efforts to rectify it. “In addition, the Aratanis gave millions in support of the Japanese American National Museum, UCLA’s Departments of Asian American and East Asian Studies, the Japanese American Cultural and Community Center, Keiro Senior HealthCare, and countless Asian American candidates.